Is a young company whose mission is to represent internacional Media for the Spanish market, on the basis of excellence in professionalism, trust and enthusiasm. We represent print media, online and TV. The leader in Tokio and in Osaka. 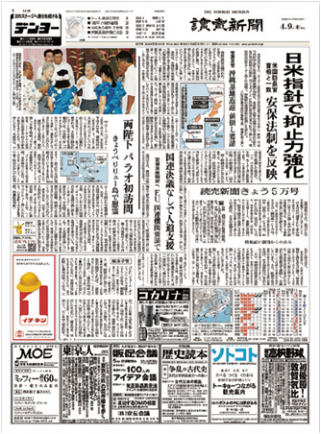 Yomiuri Shimbun is a quality newspaper, reaching the widest audience in Japan. It boasts the largest circulation with more than 10 million issues every morning. The Evening edition is characterized by enriched topics on hobbies and life as well as the latest news on politics, economics, sports and other issues. 91,7 % of the circulation is delivered to the subscribers. Since different themes are set for each day of the week, placing ads in tune with such content is effective. In March 2007, was launched Yomiuri Style Magazine, a new style mode magazine, edited a s a compact tabloid magazine to be delivered to areas where the most fashion- oriented readers in Tokyo are located. It is edited 5 times a year, at the beginning of the fashion collections. Another supplement is Travel Concierge, which is focused on the well to do and senior citizens who frequently travel abroad. Yomiuri Shimbun is as well the only daily in Japan that is having an edition in English. “The Japan News”. The contents are mainly the latest news and several articles related with other international media as The Washington Post or The Times.